One great thing about being a Physics Groupie is getting all excited about things that other people could care less about; it gives me a sense of being “special.” Case in point – the recent launch of the WISE space telescope was pretty low on most folk’s radar, but for me it was a huge deal. The Wide-field Infrared Survey Explorer or WISE launched at 6:09am Monday, December 14, 2009 from Vandenberg Air Force Base in California. The instrument rode atop a Delta II rocket into a polar orbit 326 miles (525km) high. WISE is designed to survey the entire sky in four mid-infrared bands (centered at 3.4, 4.7, 12, and 22 microns), a swath of spectrum dominated by emission from celestial objects that run the gamut from dark asteroids in Earth's vicinity, to brown dwarfs and interstellar clouds in our neighborhood of the Milky Way, to Ultra-Luminous Infrared Galaxies (ULIRGs) ablaze with intense bursts of star formation. The spacecraft has a primary telescope 16 inches (40 cm) in aperture with a pack of frozen hydrogen needed to cool WISE's heat-sensing detectors to -447°F (7½ kelvins). Yours truly along with Zoe, my girlfriend and science companion extraordinaire, were invited to attend the launch. Needless to say we were VERY excited to see first-hand a launch of this magnitude. Our invitation was courtesy of the UCLA Physics and Astronomy Department whose very own Dr. Ned Wright is the principal investigator for the WISE project. My long ties with UCLA mathematics and physics paid off big-time. Alas, we never actually saw the launch aside from good ‘ol NASA TV like everyone else. 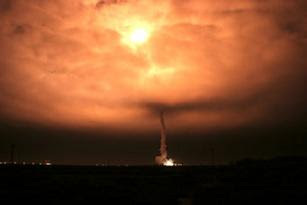 What we didn’t realize is the moving target nature of NASA launches. After one previous postponement, we headed up to beautiful Buellton, California a couple of days ahead of the launch that was scheduled for Friday, December 11. While there, we found that the mission center pushed the launch back to Saturday, then Sunday, and then Monday. The attrition due to the continued postponements was significant. From speaking to other people on hand for WISE, we found out that most NASA launches play this cat-and-mouse game with the weather, equipment failures, and preemption by secret military launches. We heard a rumor that it took the Spitzer Space Telescope two years to launch. Now that’s fortitude! The trip up to Santa Ynez wine country where Vandenberg is located and made famous by the motion picture “Sideways” wasn’t a complete washout. The WISE team put on a couple of excellent briefings that included talks by some high-profile scientists. Plus, the food in the area, along with winery tasting room visits made the rainy days a lot more enjoyable.